Love Caesar salad? 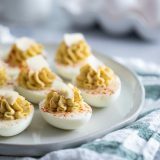 This Caesar deviled eggs recipe has all of the flavors of that Italian salad, but in a creamy, delicious deviled egg. These are a fun, different appetizer! Peel the eggs and slice in half lengthwise. Carefully scoop out the yolks and place in a medium bowl. Place the egg whites on a serving platter, cut side up. Add the anchovy past and garlic to the egg yolks. Use the back of a fork to mash it all together. Stir the lemon juice, mayonnaise and Worcestershire sauce into the egg yolks. Gradually stir in the olive oil. Season to taste with salt and pepper. Spoon or pipe the filling into the egg white halves. Sprinkle with paprika, then top with a Parmesan cheese curl. Nutrition information provided as an estimate only. Various brands and products can change the counts. Any nutritional information should only be used as a general guideline. Nutritional information does not include garnishes.